Okay. I know what you’re thinking. What is there to do in Finland and the Arctic Circle?! Girl. It's FREEZING in Finland and the Arctic Circle. What could possibly be so amazing ? How is that even possible?! Why on Earth would I want to vacation anywhere in the winter?! 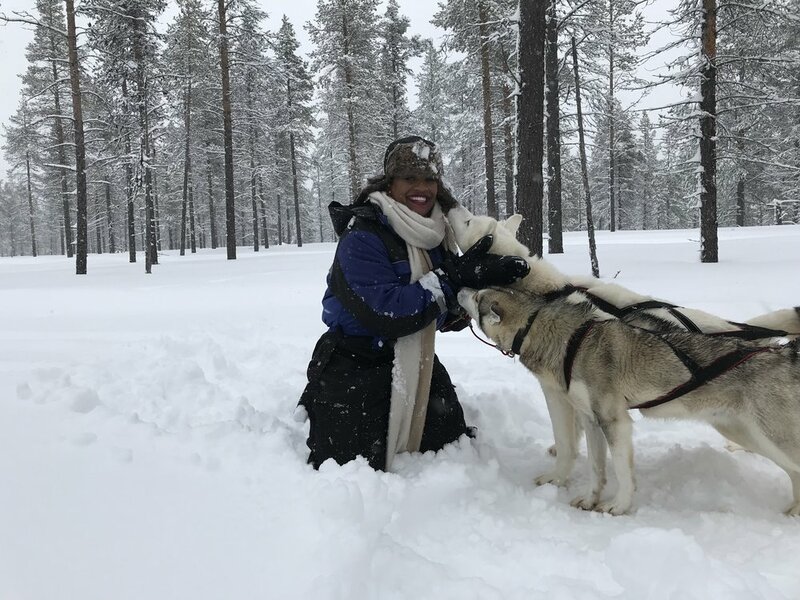 As a Floridan, I'll claim the Presidenceny of the ‘I Hate Being Cold Committee.’ However, visiting Finland’s Lapland (literally The Arctic Circle) was one of the most amazing travel experiences you’ll ever have. The beaches of Thailand and Zanzibar are amazing because who doesn’t want to lay out in the sun and enjoy a few cocktails and a sunset? However, consider an entirely new, different, and exciting experience in a country like Finland, who is looking for more people to experience their enchantment and beauty. Before heading to the Laplands, you’ll land in Helsinki, the capital city of Finland. There’s a lot to see and enjoy there, including the The Design Museum (great for design and architecture enthusiasts! ), having dinner and cocktails at Boulevard Social, or just walking around and taking in the views. If you’re looking for a centrally located hotel, then I highly recommend Hotel Haven for a small, chic, boutique hotel. To get to the Laplands, you have to take a flight on Norwegian Airlines from Helsinki to Ivalo. Stay at the world famous, Kakslaurrenanen Arctic Resort. If you’ve seen photos of people sleeping in these amazing igloos - this is likely the place! There are several types of accommodations that they offer, but I'd recommend staying in a Kelo. Think half cabin half igloo. Don’t worry about being cold. The igloo portion of the Kelo has thermal glass that keeps you insulated and warm. Not to mention a sauna inside of the bathroom! For the remainder of the activities listed below, the resort will assist you in booking them. Dog Sledding: Dog Sledding is one of those actives that you can only do in freezing temperatures. Mostly because the Huskies that pull you on the sled were created for cold weather. So much so, that even the 0* temperatures we were in (yes, that’s 0* Fahrenheit ), we were told it was “too warm for the dogs.” Whet?! After we would stop, the Huskies would plop in the snow and roll around in it because they were they hot! Crazy.The dogs are so super sweet and friendly, so you can pet and take photos of them when you ride is complete. This was so much fun! Dog Sledding had been on my Life List for the longest time! Aurora Hunting: If you come during the peak season, you’ll have the opportunity to go Aurora Hunting, or finding the Northern Lights! For most of the time we were there, it was a bit too cloudy to catch them. However, on the last night they came out for a few minutes (and of course, my a** was asleep and missed it - ugh). Take a Reindeer Sleigh Ride: When you stay at Kakslaurrenanen, you’ll learn a bit about reindeer and how they help the indigenous people of Finland, the Sami, survive through the terrain and winters in Finland. Then, you can take a reindeer sleigh ride! It’s enjoyable but short. Snowmobiling: Wow! This is one of the coolest things you’ll likely ever do! Everyone gets a snowmobile, and you take a ride through the forests and terrain of the Laplands. It’s COLD but scenic. No worries, you’ll get a face mask and a helmet to protect you through the ride. Ice Fishing: Growing up fishing, I was excited about the entire experience of ice fishing. From the resort, they will take you to Inari, which is a town with the largest lake in Finland. From here, you’ll follow your guide on snowmobiles and drive out on the frozen lake (I know, it’s wild). Then, he will choose a spot to drill holes to start fishing. He’ll show you how to drill a hole in the ice, bait your hook, then try to catch you first catch for lunch! Only one person in our group caught a fish, so we decided to film a ‘music video’ to get over the disappointment. Check Out Our 'Music Video' Below! Smoke Sauna & Ice Pool: After all of the excitement, you’ll want to relax by sitting in the smoke sauna. After 'baking' in the sauna for about 15 minutes, you'll then have to go to the ice pools and jump in! Talk about intense?! If you're a brave soul, then definitely go for it. As for me... just watch the vlog. Try some Reindeer Stew: I know. That’s mess up. Ride on a reindeer sleigh in the day and have him for stew for dinner. While I am not much of a meat eater myself, I heard the stew was really enjoyable. Although it's COLD, would you consider going to the Arctic Circle for a different type of travel experience? This trip was sponsored but all opinions on Finland are my own. Special thank you to @FlyNorwegian, #VisitFinland, #VisitHelsinki, and Kakslaurrenanen Arctic Resort for the most amazing time in Finland!